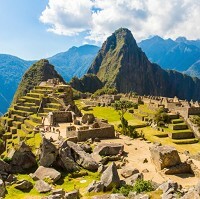 Peru has been revealed as the home of the world's top-rated luxury hotel. The five-star Palacio Nazarenas, which is located a stone's throw from Machu Picchu in the city of Cusco, finished top of nearly 900,000 online hotel reviews. It used to be a former palace and convent - but years of restoration have transformed it into one of most exclusive hotels in the world. Amenities include a heated swimming pool, guest lounge, extensive library, stylish boutique, lounge, and butler service. Your butler will assist with everything from helping you unpack to supplying you with a choice of handmade soap made with local ingredients. The intimate urban retreat, set in a tranquil plaza behind Cusco's main square, only has 55 suites, so booking in advance is recommended. Each suite is enriched with oxygen and comes with its own private bar where guests can create drinks accented with fresh ingredients grown at and around the hotel. All this doesn't come cheaper, however, with prices starting at £328 per night for rooms. The research by ReviewPro Global Review measured online guest reviews published during 2013 on more than 100 online travel agencies and review sites. The Northern Belle, a 1930s-styled, Belmond-owned train that offers overnight journeys in the UK, including to Scotland and the Lake District, scooped second place, while Jumby Bay, a high-end resort on a 300-acre private Caribbean island only accessible by boat, finished third in the rankings. India's leading luxury jungle resort, The Oberoi Vanyavilas, on the edge of the Ranthambhore Tiger Reserve took fourth place, followed by the Four Seasons Tented Camp, Golden Triangle in Thailand. Luxury escapes such as these offer the chance to get away from the stresses of daily life, but don't forget to take out adequate travel insurance before you go. This gives you peace of mind just in case anything goes wrong on your travels.